Posted by Jeff (ILoveCapitalism) at 12:45 pm - May 21, 2013. Our thoughts and prayers go out to the tornado victims in Oklahoma. Click here for some ways we can all help them. Claims that new, damaging revelations on Benghazi will be coming. Also, one of Clinton’s scapegoats is starting to balk at being scapegoated for Benghazi. Even the liberal-ish Washington Post begins to agree that the ‘Benghazi emails were doctored!’ canard has been debunked. Lois Lerner, who “apologized” for the IRS/Tea Party harassment (as if that covers it) and who some insist is “apolitical”, has a history of targeting conservatives from her 14 years at the Federal Election Commission. There she showed a remarkable curiosity about the content of conservatives’ prayers, just as the IRS later did. Coincidence? Americans are becoming aware of these scandals, with 55-56% believing that the administration has engaged in a Benghazi cover-up and in deliberate IRS targeting of conservatives. The scandals haven’t yet hit Obama’s approval ratings; then again, they haven’t been clearly tied to his inner circle yet. 59% approve of *the GOP’s* handling of Benghazi. Adding to the Department of Justice’s spy-on-AP scandal, as of yesterday we have the spy-on-Fox scandal, in which the DOJ basically makes investigative journalism a crime. For background, let’s not forget that AG Holder “has prosecuted more government officials for alleged leaks under the World War I-era Espionage Act than all his predecessors combined, including law-and-order Republicans John Mitchell, Edwin Meese and John Ashcroft.” So much for openness and transparency. But Obama’s DOJ seems to be in the habit of smearing critics, as well as prosecuting and/or spying on them. In the comments, please remember: If another’s argument is ludicrous, there is no need to engage in personal attacks; just tear it apart point by point. That it’s ironic, is clear. Obama was, after all, speaking to the AP and (among his other lies) painted the Bush administration as intolerant of dissenters. 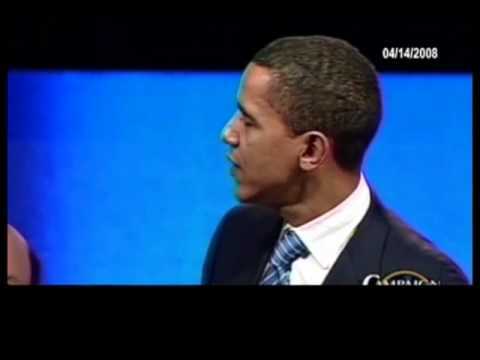 But what I really love about the clip is how Obama looks down his nose, as he speaks. It’s that note of contempt which his white liberal admirers fell for, going “Ooh, he’s so smaaarrt! He has deep integrity and wisdom!” I saw through Obama’s act from the beginning. Posted by B. Daniel Blatt at 7:54 pm - May 20, 2013. Earlier today, I caught Jim Hoft’s report on ties between the National Treasury Employees Union (NTEU, which represents, among others, employees of the Internal Revenue Service (IRS)) and the Democratic Party. Jim links us to the NTEU’s release just following the 2012 election where its president Colleen M. Kelley congratulated Obama on his reelection and noted the efforts her government employee union made on behalf of that Democrat. It would seem that President Tee could choose to go outside the normal chain of command to issue an illegal order by simply telling the head of Union N to inform the union members she leads to pursue the policy, rather than issuing a formal order to the head of the IRS. Ace spins out an interesting scenario which, given what we know about Chicago politics, does not seem that far-fetched. That said, I’m with Ace who disagrees with the authors of the report he linked; “I don’t think this meeting is a smoking gun,” but I do think it is significant and news outlets should report it. And journalists should be asking Jay Carney, in his next press briefing, to tell us what transpired in that meeting. And they should ask the president as well. Reporters should be doing what they can to learn what passed between the president and the union boss in March 2010. UPDATE: Maybe there is nothing to that meeting. But, the time is indeed curious. UP-UPDATE: Doug Powers has more. Posted by B. Daniel Blatt at 3:42 am - May 20, 2013. If Obama were truly outraged by the targeting, he would have ordered the IRS to investigate as soon as the first reports became public. And would use stronger terms than he has. He would be ordering the Treasury Secretary not just to hold “those responsible for these failures accountable”, but would also be making clear that those responsible could lose their jobs — and face prosecution. To note, as per Jonah’s point, the president didn’t ask the immediate past Treasury Secretary to take action when the story first came to light. Nor has he specified how those responsible would be held accountable. Doesn’t seem like the consequences will be very severe. Posted by Jeff (ILoveCapitalism) at 5:36 pm - May 19, 2013. IRS told pro-life groups that they should stop peacably demonstrating. Where is the ACLU on this? You know: freedom of assembly, something the ACLU proudly defended in Skokie? Are pro-lifers really lower (in the ACLU’s eyes) than actual KKK-hooded neo-Nazis? The “Benghazi e-mails were doctored!” canard, refuted. Senior White House Advisor Dan Pfeiffer, discussing the IRS and Benghazi scandals this morning, apparently did Obama no good with his over-use of the word “irrelevant”. Superficially, Pfeiffer said: The IRS activity was outrageous, regardless of whether it was illegal. Which sounds like taking the high road. But Washington-speak is notoriously indirect. Pfeiffer may have been saying: The administration/DOJ is giving NO focus to the question of legality, as we intend to have no prosecutions. Again, note Pfeiffer’s posture. While expressing outrage over what the IRS did, he carefully plants the suggestion that it might have been legal – which would mean that no prosecutions are needed. Sorry Mr. Pfeiffer, I don’t think so. Posted by B. Daniel Blatt at 3:33 am - May 19, 2013. And if these progressive groups were not subject to such scrutiny, could someone at the IRS please explain why not. UDPATE: Did they ask any “progressive” groups to agree not to protest any social conservative institutions as a condition of receiving their 501 (c)(4) status from the federal government? UP-UPDATE: Seems a handful of “progressive” groups were singled out for extra scrutiny: Nonconservative Groups Say IRS Scrutinized Them, Too (Via HotAir headlines). Posted by Jeff (ILoveCapitalism) at 1:01 am - May 19, 2013. With apologies to the GayPatriot blog’s many Jewish friends and to its many “secular conservative” atheist/agnostic friends. My only comment on the following material shall be this summary: It seems that Jesus took note of who was a tax collector and was willing to forgive them, on the premise that they were sinners who obviously needed to repent of their many crimes against their fellow man. What took the IRS so long to come clean about the scandal? Posted by B. Daniel Blatt at 3:09 am - May 18, 2013. Scandal central? Or a whole lot of talk that will amount to nothing? Posted by Kurt at 10:46 pm - May 17, 2013. As the scandals engulfing the Obama Administration have proliferated and “gotten legs” this week, many of the conservatives I know or whom I hear on the radio have started drawing comparisons with what happened under Nixon, bringing up the word “impeachment,” and hoping that as it becomes evident that these activities were not accidents but part of a coordinated strategy, Obama will eventually resign, or at least some of those who hold key posts of power in this administration–such as Eric Holder–will resign and that the Administration will be hopelessly tainted as the truth becomes known. I hear that talk, and I think, it would be nice, but I can’t see it happening. Maybe Holder will resign. Maybe. I can imagine the press starting to subject the Obama Administration to a little more scrutiny in the future, but “a little more” than none is still only a little bit of scrutiny, hardly enough to make a significant difference in public opinion. While the outrage surrounding all of this may be enough for the Republicans to hold the House and to gain control in the Senate in 2014, there will still be formidable problems, and we’ll still have a very divided country. The low-information voters in the electorate will still be willing to give Obama the benefit of the doubt because most of them are either unwilling to see him for the cynical, partisan character he is, or they are unable to do so. It is possible that after a year or two of scandals and after the outrage that is sure to follow the full implementation of Obamacare, Obama will end his second term with even lower approval ratings than George W. Bush ended his, but at this point, I think that’s about the most we can hope for, that, and maybe Holder’s resignation. I’m not even sure any of this will derail the immigration bill, which is looking more and more like the next legislative disaster coming down the pike. I’m not trying to be pessimistic, merely practical. In the lead-up to the election in November, I knew that what happened with the administration’s lies about Benghazi was an outrage, but after the election, it seemed evident to me that Obama, Hillary, and the entire administration were going to get away without any consequences. The American voters had failed to demand answers and accountability and had just re-elected Obama. So what do our readers think? Am I just being pessimistic about all this? Is the investigation of these scandals likely to have real and significant consequences for our government, or are they a lot of talk that will amount to nothing, or at least nothing much? Posted by B. Daniel Blatt at 12:21 pm - May 17, 2013. Some news reports just speak for themselves. NBC’s Lisa Myers reported this morning that the IRS deliberately chose not to reveal that it had wrongly targeted conservative groups until after the 2012 presidential election . . . Via Ace. Barack Obama’s much vaunted commitment to transparency notwithstanding, that Democrat is more interested in winning elections than in opening the books on his administration. Why did the IRS keep the scandal quiet until after the election? Before Obama, did IRS ever ask for names of teenage* interns? Posted by B. Daniel Blatt at 6:00 pm - May 16, 2013. I updated a previous post to cite reports that the IRS has requested the names of high school and college kids which conservatives organizations were training/mentoring. The tax-collecting agency sought to identify and track student interns at the Leadership Institute, a conservative educational organization based in Virginia. At around the same time the IRS began its “inappropriate targeting” of conservative organizations applying for nonprofit status — a practice detailed in a Treasury Department inspector general’s report published Tuesday — the agency conducted an audit of the Leadership Institute. The institute has offered workshops, seminars, internships, and other training programs for young conservatives and grassroots activists since its founding in 1979. It is not the only known instance of the IRS seeking information about conservative students. Kevin Kookogey, who founded a conservative mentoring program for high-school and college students in Tennessee, told National Review Online the IRS asked him to “identify the students I’m teaching and what I’m teaching them” as part of his application for 501(c)(3) nonprofit status. So this got me wondering if the IRS had ever previously asked organizations applying for 501(c)(3) or (c)(4) status (or organizations with such status under audit) to name their interns. Do any of our readers know if that happened before? I will link any credible report of such requests. Was the same person (or persons) who crafted the questionnaire the individual (or team) deciding to ask for the names of high school and college kids? Posted by ColoradoPatriot at 4:14 pm - May 16, 2013. Unfortunately for the president, his best defense is the same reason Americans should reject his liberal agenda to make the federal government more powerful, more intrusive, and more involved in the decisions we make. The bigger government gets, the less control the president has and the more opportunities there are for abuse. I’ll have more to say about this soon, and I could cut-and-paste every word in this article, but you might as well just read the whole thing. Posted by B. Daniel Blatt at 4:02 pm - May 16, 2013. The garbage creature just let out another growl. “Send us your Facebook pages, your Twitter pages,” and I said, “Does that include personal pages?” and they said, “Everything.” They wanted to know your personal relationships with politicians and political parties. And I asked, “What would happen if I don’t send this to you?” and they said, they made an insinuation like, “Look, it can be considered perjury if you omit things from the IRS.” I’m a pregnant stay-at-home mother on one income, I thought, “Oh, my goodness, I’m not doing anything.” I stopped. Via Instapundit. Seems the snooping strategy had the desire effect. It hindered one engaged young woman from actively debating issues of public concern. She wasn’t the only woman impacted by the IRS intimidation. Posted by Jeff (ILoveCapitalism) at 11:54 am - May 16, 2013. Only days ago, Obama gave a speech in which, rather than warn us against tyranny, he warned us against the people who go around warning us against tyranny. The IRS revelations only get worse: From the Washington Examiner yesterday (via Ed Morrissey this morning), we learn that the IRS demanded of a pro-life group – under “perjury of the law”, the IRS staffer’s words – that it not engage in legal Planned Parenthood picketing. And required another pro-life group to furnish detailed plans on its constitutionally-protected speech activities. This is the same IRS that Obama has been beefing up to enforce Obamacare by demanding ever-greater private information of citizens. In these disparate data points, I see a pattern: Obama wants to be a tyrant – while pretending not to. My question is, do liberals really not see the pattern? I know that some liberals have begun seeing it – and will, for example, condemn the IRS actions – but others don’t. The other day, I noted Julian Bond saying that he thinks conservative groups deserve the IRS harassment. The execrable Bill Maher has joined the fun there. Obama maintains his democratic pretense by periodically declaring the goodness of his intentions. For example: yes, the other day he called the IRS actions “inexcusable”. But a troubled President Nixon, as well as actual tyrants like Chavez and worse, also frequently declared their own goodness. So many of Obama’s other words, policies, and actions of his underlings point in a direction opposite to his self-declared goodness. Do liberals really not see? Or are they part of the pretense; de facto pro-tyranny? Students of history will note that the Fascists also believed in having powerful civilian, national security forces, and will be troubled by the weird applause that Obama’s liberal audience gave him for proposing it. (*that the IRS reserved for Tea Party groups)? Posted by B. Daniel Blatt at 2:08 am - May 16, 2013. An opposition researcher’s fantasy. . . . Wonder if any allies/associates of the president have an expertise in that kind of work. An investigation into this matter will not be complete unless it identifies the author or authors of these questionnaires and deposes them under oath to ask why they crafted the requests they did — and at whose behest. If a candidate snoops around in the divorce records of his political opponents. . . .
Posted by B. Daniel Blatt at 12:59 am - May 16, 2013.
. . . it stands to reason that that man’s minions might be interested in using the IRS to obtain information about his ideological adversaries. Will Obama Do “Everything” Within His Power To Ensure This Never Happens Again? Posted by ColoradoPatriot at 10:43 pm - May 15, 2013. Now, there is a possibility, I suppose, that he’s lying. Greetings, my fellow Americans. I come before you to start a new chapter in American politics. I realize that I told you that I’d start a new chapter in American politics almost five years ago when I won the presidency. I said then, as I had throughout that campaign, that my administration would usher in a new type of politics in America. Many of you first heard about that dream four years earlier when I delivered a speech to the Democratic National Convention extolling the virtue of Red States and Blue States coming together as one Nation working together to solve our problems and live in harmony. Indeed, many of you were enthralled with the concept of a young and charismatic politician who did not pit Americans against each other, and throngs of you from both sides of the political aisle came together to make history by electing me as president in 2008. You believed in that new chapter of American politics I sold you at that time. Perhaps I did too. I am going to be frank with you in my assessment of my own record since then. Simply put, I have let you down. I let you down during my first term, for example, by suggesting those who opposed my $800,000,000,000 increase in government spending were “rooting for failure“, and in an effort to convince you that the government was a better judge of your health-care decisions than even your doctor, insinuating that some of them perform unnecessary surgeries simply for their own monetary gain, among many other instances. I often highlighted not simply the differences of opinions—fair game in the rough-and-tumble sport of politics and vital in the arena of competing ideas—but impugned the motivations of my opponents. It wasn’t simply that Fox News, for example, showed an opposing view, my thin-skinned response was that they were “entirely devoted to attacking my administration“. I had no qualms with singling out individual citizens who were expressing their First Amendment rights to disagree with my policies publicly if it would provide a face to demonize rather than forthrightly and honestly defend my positions. On topic after topic, in forum after forum, it was belittling those who disagree with me as bitter clingers, and that my supporters should “punish our enemies“. Heck, just last year, my campaign produced a commercial that—no kidding—said my opponent was “not one of us“. Okay, sincerely, as an aside, I’m surprised at the lack of irony Americans displayed when I, of all people, was allowed to get away with that one…but that’s a story for my memoirs and I digress. Point being, I have fostered, as much as or possibly likely more than anybody an atmosphere of demonizing your political opponents to the degree that we cannot even get along and agree to disagree anymore. Let’s set aside my cynicism in having suggested that I am the non-cynical one in all of this and simply recognize my role in the degradation of our political culture. Now, let me be clear that I state unequivocally I never explicitly directed nor even winked-and-nodded to anybody who works for me nor any part of the government to single out my political opponents for IRS scrutiny. But as I reflect on the employees of the Federal Government, I cannot help but recognize the role that my leadership must have had on them. In no way do I excuse this despicable and illegal conduct and I stand behind my comments and my commitment to follow the trails to those who did this and punish them accordingly. That said, I certainly deserve part of the blame here. Therefore, starting now, I will institute a new form of public dialog. From this day forward, I vow to never again attack my political adversaries’ motives but rather honestly and straightforwardly challenge them on their positions and policies. We will disagree, and the arguments will be pointed and heated at times, but they will not—at least from me—ever be personal again. Let me start by acknowledging unequivocally that my opponents do not want poor people to starve and die naked and emaciated in the streets. They do not want poisoned air and water, and that they want a clean environment for their children just as much as anybody does. My opponents don’t hate gays, Muslims, nor foreigners. They don’t want you to go without teachers, policemen, firemen, libraries, or White House tours. Just like me, they want to help people stay healthy and have access to health-care…they just want to approach it a different way. Just like me, they want our children and families and friends to be safe from random acts of violence…they just have a different idea of how to achieve that. Just like me, they want a revitalized economy and more people working fulfilling careers…they just don’t agree with how we get there. Just like me, they want a strong and respected America that leads the world…we just differ on what that means and what it looks like. Now, to my supporters, don’t worry…I’m not disarming unilaterally. I am not in any way abandoning the foundational ideas of a strong and effective centralized government playing an active role in our citizens’ lives in an attempt to make our Nation great and strong. But going forward, I will respect my opponents’ motives and respect that they also hope for the best for America and want our Nation to be strong and prosperous. I cannot promise that my taking this new approach will ensure no underlings in the IRS or other parts of the government will never again act as recklessly and criminally. But I can guarantee you that as of this moment, this evening, right now…they will never be able to imagine for a moment that I, President Barack Obama would even for a second condone such actions. I regret that it is incredibly likely that up until now, they may very well have. My partner says it’s also “in his power” to just resign. I suppose I’d give both possibilities about equal chance. UPDATE: My apologies (mine, ColoradoPatriot, not the hypothetical president)…no end of troubles with WordPress last night. I didn’t realize till this morning that comments had been turned off, now since rectified. Posted by Kurt at 11:15 pm - May 14, 2013. Filed under: AMERICA HELD HOSTAGE,Arrogance of the Liberal Elites,Benghazi / Libya crisis,Big Journalism,Crony Capitalism Consequences,Democratic Scandals,Environmental Wackos (ManBearPig),IRS/Tea Party Scandal,Media Bias,Obama Dividing Us,Obama Health Care (ACA / Obamacare),Political Scandals,Socialism in America,Where's the Scrutiny? One recurring tool of socialist tyranny is the capricious enforcement of unworkable laws. He quoted the passage in making a point about the “capricious enforcement” which was an inevitable feature of the unworkable mess better known as Obamacare. But two and a half years later, it’s evident that observation could just as easily have been applied to our byzantine tax code, our environmental regulations, and even laws pertaining to press freedoms under the Obama administration. As Dan wrote earlier today, the only folks who are surprised by any of these scandals are the ones who haven’t been paying attention to what has been going with our government since January 20, 2009. I will tell you this on the IRS front. I’ve worked in this town for over 20 years in the White House and on Capitol Hill and I can say with a very strong sense of certainty that there are people very close to this president that not only knew what the IRS were doing but authorized it. It simply just does not happen at an agency level like that without political advisers likely in the West Wing certainly connected to the president’s ongoing campaign organization. And it’s not just the IRS. Earlier today it came out that the EPA waived fees for leftist organizations and leftist journalists who requested information, but not for conservative ones: “Conservative groups seeking information from the Environmental Protection Agency have been routinely hindered by fees normally waived for media and watchdog groups, while fees for more than 90 percent of requests from green groups were waived, according to requests reviewed by the Competitive Enterprise Institute.” Yes, this would be the same EPA that has classified carbon dioxide as a pollutant, making the mere act of exhaling potentially troublesome. A coincidence? I think not. This is the same administration committed to picking winners and losers on most matters. Hence, it should surprise no one that while oil companies are prosecuted for the deaths of eagles and other protected species, the bird-killing wind farms are naturally given a pass. Clearly, some energy companies are more equal than others. And so what else do we see today? Well, all of a sudden the administration’s lackeys in the press such as Hilary Rosen are now out expressing their sympathy for poor Jay Carney. I guess they’re afraid of ending up as the subject of a DOJ snooping scandal or an IRS investigation or a selective leak.